Add graduation party favor supplies to your planning list. 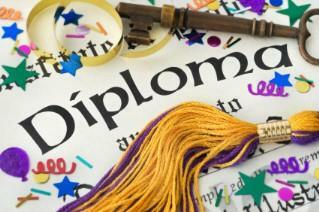 Make homemade graduation party favors as a memento of the special graduate's accomplishments. Whether the graduation party is for a kindergarten, high school or college graduate, guests will appreciate a token of thanks from the graduate. Graduation party menu ideas often consist of finger sandwiches, mints and cake. Put your culinary skills in action to create more than just a light meal for your party guests. Make graduation favors to send home with guests that treat them after the celebration has ended. Visit party supply stores to find cookie cutters in the shape of graduation caps, gowns and scrolls. Cutters with the graduation year ('09, '10, '11) make the cookie personalized. Decorate with frosting in your graduation or school colors. Cover the cookies in plastic wrap, twisting the top. Add some curling ribbon in a matching color and a short tag with a thank you to the guests. Set the cookies on a fancy tray near the guest book. Candy molds are available at craft and kitchen stores across the country. Choose graduation-themed molds or a mold that accompanies a secondary theme, such as a luau party. Add a stick to make the candy a lollipop, perfect for youngsters attending the party. Wrap plastic around the top, adding a bow at the bottom. Put the candy sticks into a small party pail with Styrofoam on the inside to create favors that doubles as table centerpieces. Graduates who have a favorite dish often want to serve it at their party. Share the special recipe with everyone who attends. Print up recipe cards using the computer, adding graduation graphics and school colors. Attach a small favor that relates to the recipe, like a seasoning spice bottle or a small wooden spoon. Put the favors in small mixing bowls on the tables or at the end of the food buffet. Bookmarks: Cut plain cardstock into bookmark shapes. Punch a hole in the top and tie string through the hole to make a tassel. Add a few graduation stickers to the front of the bookmark. Candles: Make small candles in your school colors. Purchase some votive candle molds and use your favorite candle making recipe for a keepsake favor to send home with guests. Jewelry: Make beaded necklaces and bracelets in the school colors. Flower Pens: Purchase black, blue or red ink pens in bulk. Buy faux flowers at a craft store. Line the flowers up with the pens, leaving the flower head at the top of the pen. Wrap the pen and flower stem together using green floral tape. Put in small vases around the graduation party. Graduates that are planning a graduation party that is themed may want to make crafts that relate back to the theme. Make origami leis for a Hawaiian party or masks for a costume party. Making graduation party favors can be cheap and unique, but it also can be time-consuming. Figure out your guest list early and start picking up supplies a few months in advance. Depending on the difficulty of the project, you may want to begin making them at least a month before the party. Craft favors will not spoil like food favors, so making them early is not an issue. Even if you cannot come up with graduation party ideas for homemade graduation party favors, you can still add a personalized touch. Purchase your favors, then make the packaging yourself. Decorate small white boxes, bags or pails to fit your graduation party decorations. Paint, sparkles, stickers and ribbons are perfect additions to simple packages. Handwrite a short note on the package or attach a tag to the package for a personalized touch. Give your graduation party guests homemade favors to show them how much you appreciate their support throughout your school years..